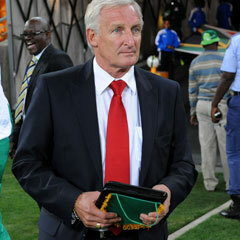 Johannesburg - Bafana Bafana coach Gordon Igesund says his technical team are doing a good job of analysing their opponents in Group A of the AFCON 2013 which starts on January 19. According to the Soccerladuma.co.za website, the national team's opponents are Cape Verde, Morocco and Angola and coach Igesund said that the people assigned to assess the first round opposition are already doing a great job. "I know Angola is already in the country and they will be playing Moroka Swallows and other teams as well. We are following Morocco and Cape Verde closely in their preparations. "But though we are spying on the opponents the most important thing is to have our preparations on spot and we are well on track in that department. "We are starting another camp on January 2nd, with these 23 players and that's when we will see the right direction we have to take. Then the two friendly games against Norway and Algeria to wrap up the preparations," the four time league winning coach concluded.